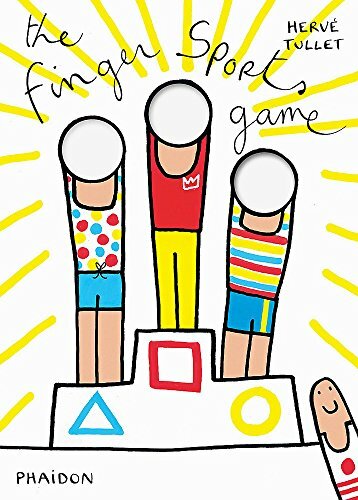 Here's the premise of The Finger Sports Game: draw a face on the tip of one or more of your long fingers, then stick it through the hole(s) to pretend you are the head of the body doing the sport illustrated on the page. The book, including the cover, has diecut holes throughout to allow for participation in these imaginary activities. Some pages even have longer, hot-dog shaped holes so that you can move up and down as the sporting action might dictate. You get to dive into a swimming pool, leap, slide—you name it, your finger gets a real workout. The art is a level above stick figures with just basic retro shapes of headless humans; it's bright and fun and just right for this book—series of books, actually, as there are dozens of these titles available. The board book format makes it sturdy enough for roughousing, and preschoolers will really dig the play aspect of what is essentially the perfect traveling toy. Lisa Rojany has a master's degree in literature from Brown University. She is the bestselling author of several young adult novels; a YA biography, Surviving the Angel of Death: The True Story of a Mengele Twin in Auschwitz; Writing Children’s Books for Dummies, Second Expanded Edition (2013); adult nonfiction; and many children's books. For over 20 years she has run her own business, Editorial Services of Los Angeles, in which she helps writers of fiction and nonfiction make their work the best it can be.